Our fourth salon on August 16, 2011, “New Ways to Measure Human Prosperity – Beyond GDP” examined one key aspect of the “beyond growth” debate: the controversial use of GDP (Gross Domestic Product) as a yardstick for human welfare. Technical though the topic might sound to the uninitiated, it raises fundamental and often fascinating questions, as the evening’s lively discussion proved. 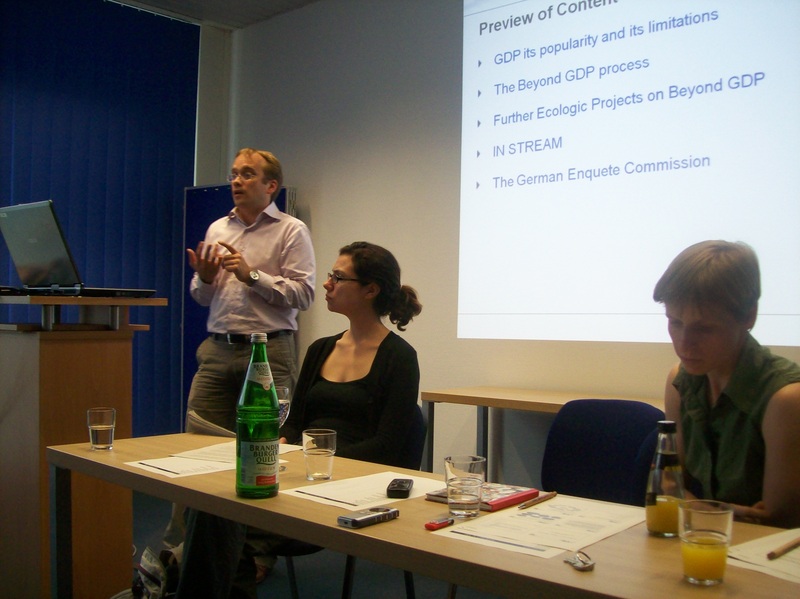 The salon was kindly hosted by the Ecologic Institute, an international think tank for environment and development, whose resident experts Lucas Porsch and Tanja Srebotnjak opened the evening with presentations on basic GDP issues. In contemporary media shorthand, “GDP” is the indicator of a country’s economic welfare – one that most people have come to take for granted, without asking what the term actually means or how it came into use. Lucas Porsch, an economist and Fellow at the Ecologic Institute, countered this naïve view by taking a historical look at the development of GDP. In fact, economists devised GDP solely as a way of predicting sales; it achieved popularity due to its well-established methodology and timely availability. It has serious drawbacks, however, when seen as a measure of economic welfare in the broader sense. On a fundamental level, it ignores non-material (ex. social) components of human welfare. It cannot measure things that lack market prices, such as public services and unpaid work (volunteering, care-giving, etc.). It ignores depletion of human, material and environmental capital. And it is unable to detect proximities to critical values for overconsumption, i.e. when a dangerous tipping point could be reached (ex. overfishing, climate change). Thus, attempts are underway to shift the focus away from GDP and toward other indices that do better at measuring the complexity of societal welfare. For instance, in 2007 the Ecologic Institute organized a “Beyond GDP” conference for the European Commission, and it has a number of ongoing projects examining alternative welfare indicators (IN STREAM, OPEN: EU, Ökoworld). 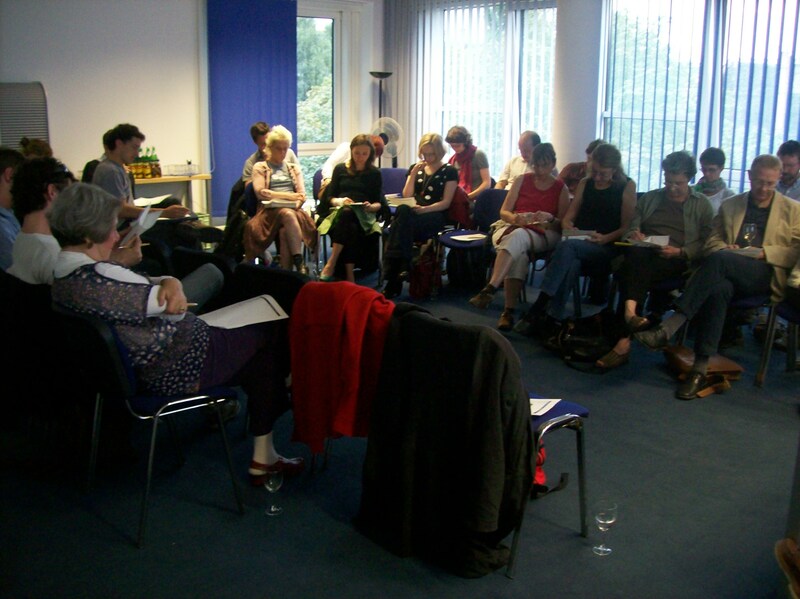 In the German Bundestag, an Enquete Commission was appointed in 2010 to explore the issue. Ecologic Institute statistician Tanja Srebotnjak began by quoting Robert Kennedy: “GDP measures everything except what makes life worthwhile”. But she went on to point out the complexity of developing an alternative index, the difficulty of measuring and weighing the often-intangible factors that make up human prosperity. The point was driven home with a hands-on exercise: audience members were handed a sheet with the 11 different categories that make up one such alternative, the OECD Better Life Index: housing, income, community, education, jobs, environment, governance, health, life satisfaction, safety, and work-life balance. We were told that we had 100 points to distribute among these categories according to our priorities. A difficult exercise – and highly subjective, as a comparison of several worksheets showed. Complicating factors include the necessity of weighing individual vs. societal perspectives, current versus future generations, monetary vs. non-monetary values and short-term prosperity vs. long-term sustainability. In the end, Srebotnjak argued, no one index will suit all needs; most likely we will end up using several supplements to GDP and other traditional economic benchmark indicators. The final speaker, Rich Rosen, Senior Fellow at the Tellus Institute in Boston, elaborated on this point. 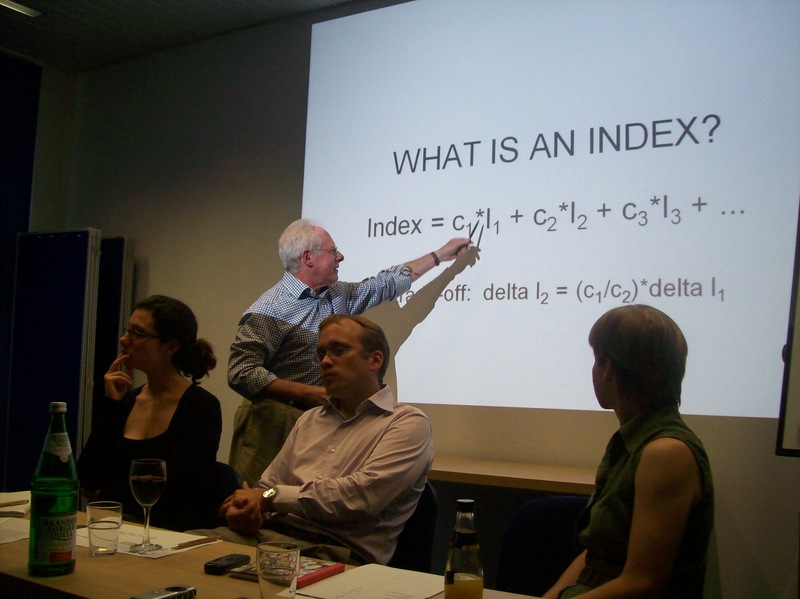 He began by explaining the relationship between “indicators” and an “index”: an index is an aggregate of different indicators (see photo). The difficulty lies in the fact that the indicators need to be weighed against each other and thus need a common unit of analysis. The advantage of GDP is that it has a very clear unit of analysis – money. Other than that, he argued, GDP is completely useless, as it only measures consumption and investment and is blind to sustainable development. (Particularly within investment, the GDP does not distinguish between good investment dollars that help us achieve sustainability, and bad investment dollars that make things worse.) One key issue is that an index cannot simply allow trade-offs among its indicators (as we did when distributing our 100 points) – some factors simply must be limited or they will reach dangerous thresholds. No single index will suffice; in a complex system, each indicator must be looked at separately. Lisa Pettibone from the FU Berlin’s Environmental Policy Research Center moderated the panel discussion that followed, starting with the question of how we can convince “users” (i.e., policymakers and the public) to embrace alternative indicators. Lucas Porsch pointed out that the only alternative indicator that has gained traction in the media and with the public is the “ecologic footprint” – despite its complexity, it tells a compelling story. Tanja Srebotnjak emphasized the importance of involving politicians and citizens in the process of developing indicators. By contrast, Rich Rosen argued that rather than first asking what the “users” want, we need to start with sound science, policy and ethics while educating the public over the long term. 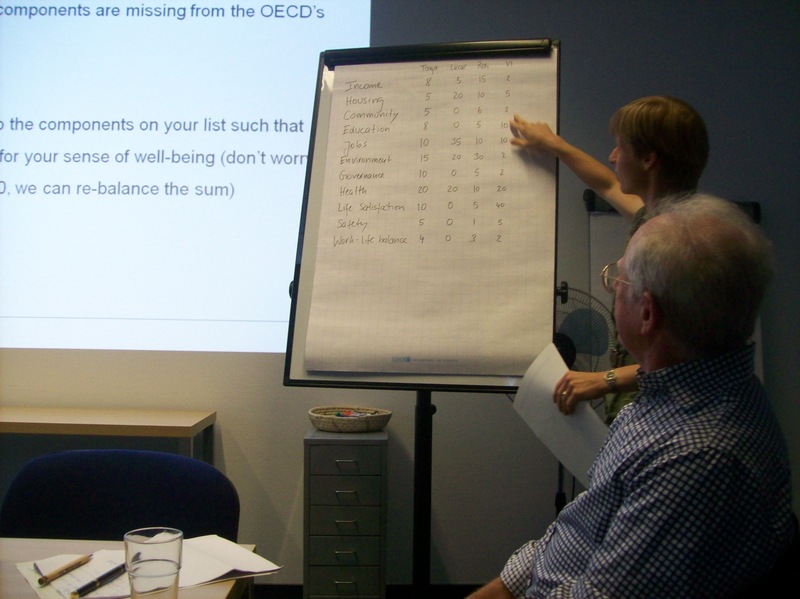 The audience filling out the OECD worksheet. A lively audience debate followed. One point of discussion was the transatlantic aspect – “beyond GDP” initiatives in Europe as opposed to the U.S. So far we had only heard about European initiatives. Lisa Pettibone pointed out that the U.S. government actually created a set of alternative indicators before Europe, in 1993, but abandoned them in 1999. However, the Obama administration’s new Partnership for Sustainable Communities, a joint effort between the Department of Housing and Urban Development, the Department of Transportation, and the Environmental Protection Agency, examines the issue to some degree. And there is a lot of movement on the local level; cities such as Seattle, Portland (OR) and Jacksonville (FL) are frequently the first to develop alternative indices (often focusing on “quality of life”), though each takes a very different approach. Against the background of current economic and financial market concerns, some questions focused on the relationship between the GDP, economic growth, and the stock market. Rich Rosen said that stock market movement does not affect GDP at all, while Lucas Porsch pointed out that it has a psychological effect; when the stock market is booming, people will spend more, contributing to GDP. The correlation between GDP and economic growth raised more fundamental issues. Lisa Pettibone noted that sustainability activists regard GDP growth as inherently negative, as growth itself needs to be avoided. Lucas Porsch argued that GDP correlates with many positive indices (jobs, income, etc. ); we don’t need less growth, we need growth of different things. Rich Rosen countered that undesirable factors such as defense spending are also correlated with rising GDP; instead of focusing on these correlations, we need to break them. Finally, much discussion centered on the question of how to make these complex issues accessible to the public – finding the right “story” or image to convey. For instance, one audience member found the image of planting trees to offset a plane flight more tangible than that of a “carbon footprint”. Others pointed out that the public has already embraced many health indices such as cholesterol counts, environmental indicators such as water quality (brought home, for instance, by beach closings) or complex notions of “livability” (“America’s 10 Most Livable Cities”). After the panel was officially adjourned, a lively informal discussion continued for some time over wine and snacks thoughtfully provided by the Ecologic Institute, rounding out a stimulating and thought-provoking evening!